Performance Acura (St. Catharines, ON) – The 2015 MDX once again sets the benchmark for the category by delivering a high level of luxury, comfort, functionality and fuel efficiency in Canada. A sleek, premium exterior design, a large, versatile cabin brimming with the latest in Acura technology and a direct-injected V6 engine all add up to another equal, yet textbook, collaboration of luxury and performance – and a driving experience you’d never expect from a luxury SUV. The 2015 Acura MDX is a well-crafted mid-size luxury crossover with a host of high-performance features, dynamic handling mixed with a smooth, comfortable ride, as well as a quiet cabin. It also drives with confidence thanks to an acclaimed AWD technology as standard equipment. According to Acura Canada, the exterior design lacks pizzazz, brake pedal feel could be better, and manipulating the third-row seats remains a chore. Others don’t like the confusing dual-screen layout and unintuitive navigation/audio controls. The lineup consists of four trim levels including the base MDX, NAVI, TECH and ELITE. For pricing details, click here or for exclusive offers, special deals and discounts click here. Standard features include 18” wheels, LED headlights, a power moonroof and tailgate, keyless access, a 432-watt audio system, a heated steering wheel, leather seats, and tri-zone automatic climate control. More upscale models add 19” wheels, navigation, a premium sound system, advanced safety features, and more. Based on Natural Resources Canada’s new 5-cycle testing procedure to determine fuel consumption ratings, expect to burn 12.7L/100km in the city and 8.5L/100km on the highway with your MDX. No significant changes. 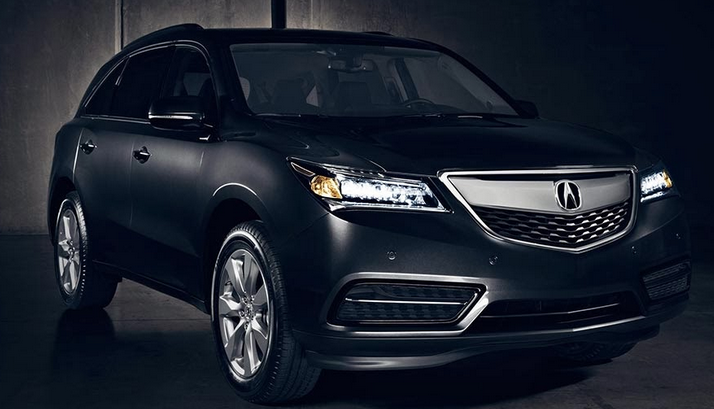 The MDX was redesigned just a year ago. The MDX features a 3.5L V6 with i-VTEC and direct injection, two of the components of Earth Dreams technology that help it produce 290 horsepower and 267 lb-ft of torque while enhancing fuel economy significantly. It’s handled by a 6-speed SportShift automatic transmission with paddle shifters, as well as Acura’s famous Super-Handling All-Wheel Drive (SH-AWD) system. The 2015 Acura MDX offers 447 litres of cargo room behind the third row, 1,277 litres behind the second row, and 2,575 litres behind the front seats. Beyond ABS, brake assist, and electronic brake force distribution, you’ll find Vehicle Stability Assist with Traction Control, Trailer Stability Assist, and seven airbags. Additional advanced safety features include Lane Departure Warning, Lane Keeping Assist, Forward Collision Warning, Adaptive Cruise Control, Collision Mitigation Braking, and a Blind Spot Information system.